The red variety is an interspecific new breed between Piquepoul du Gers ( Fool Blanche x Riparia Grand Glabre (presumably the paternal seed was a pollen mix). Synonyms are 24-23 Baco, Baco 1, Baco 1-24, Baco 24-23; Bacoi, Baco Negru, Bago, Bako Noar, Bako Noir, Bakon, Bako Sieiski, Bako Speiskii and Frybert. 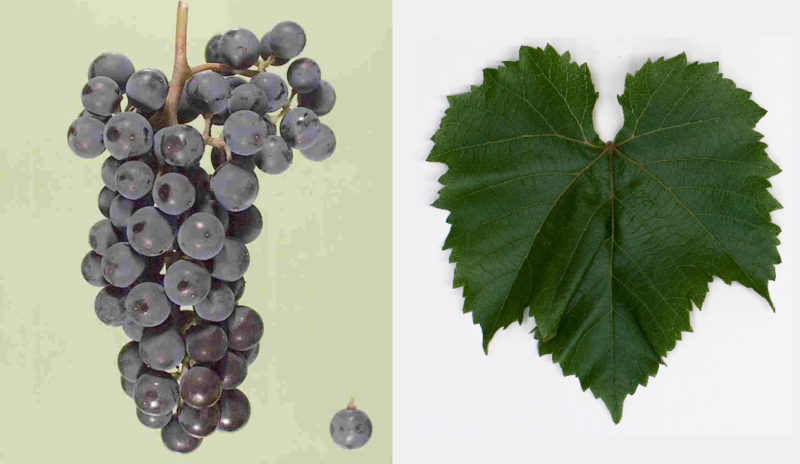 They are genes of Vitis riparia and Vitis vinifera contain. The intersection of hybrid took place in 1902 by the French breeder François Baco (1865-1947) in Bélus (southwest France). The variety was crossbred partner of the new breeds GR 7. Olivar and Totmur and will / was also as rootstock used. The early ripening vine is resistant to both mildews but prone to black rot, It produces colorful, acidic red wines that have no Foxton respectively. Baco Noir used to be in France, especially in the Burgundy widespread. Due to the EU ban on hybrids, the stock shrank dramatically. In 2010, only 11 hectares were recorded. In the Switzerland she is represented on one hectare. In 1951 she was in the United States introduced where they are in the states Michigan. Mississippi. new York (240 ha), Oregon. Pennsylvania and Wisconsin is cultivated. Already in the 1940s, she had the French-born viticulture pioneer Adhémar de Chaunac (* 1896) after Canada brought in 2010 a total of 373 hectares. This page was last modified at 5 January 2019 at 20:09.